At the recently concluded EICMA 2018, Honda unveiled the all-new CB1000RR. The bike has been given a mild update for 2019 and that too in the electronics section. The Honda’s well-known superbike gets separate wheelie and traction control. As an added benefit, riders can have a different amount of interventions, meaning wheelie control can be dialed up high but with less traction control, and vice versa. A separate ‘W’ three-position setting is now seen on the instrument console, alongside the engine braking, power, and traction control setting. The new Honda CBR1000RR gets slightly tweaked ABS setting. Also, it gets less intervention above 120 kmph. The electronics offer 15 percent more deceleration. The throttle plates now react more quickly to rider's input, and the ride-by-throttle is faster than before. Apart from all these electronic and performance enhancements, Honda has also introduced new color and livery options for both the standard and SP version. 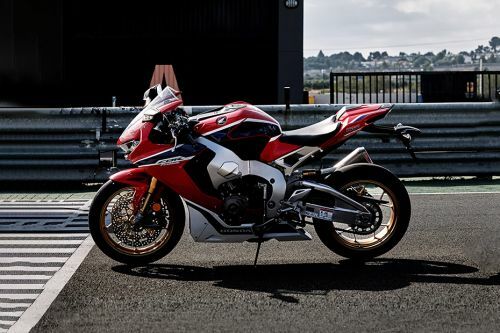 Have a question on CBR1000RR? CBR1000RR is available in 2 different colors - Matte Black and Grand Prix Red. Watch latest video reviews of Honda CBR1000RR to know about its performance, mileage, styling and more. What are the Safety Features Available in Honda CBR1000RR? Is Honda CBR1000RR available in Electric?